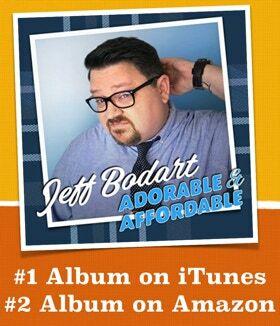 In April of 2012, On Tour Records released Jeff&apos;s first comedy album, They&apos;re Still in the Can. In January of 2018, On Tour Records released his second album, Adorable & Affordable. Both albums can be found on iTunes, Amazon, Pandora and other various websites. You may have seen Jeff on the Comcast Cable network, WB, or Fox where he was featured on the new show, Laughs. Also, you may have also heard him on Sirius/XM satellite radio. Jeff was featured on Comedy Central Radio as a result of being a semi-finalist in Comedy Central&apos;s national talent search, Up Next. And he has also performed in the the comedy festivals: The World Series of Comedy, Laugh Your Asheville Off and was also invited to perform at the Cape Fear Comedy Festival. He also made his acting debut in the syfy TV movie, "Gila! ", a remake of the 1959 classic, "The Giant Gila Monster" and also had a supporting role in the award-winning independent short film "Dandelion Dreams". Jeff&apos;s style is so relatable you&apos;ll feel like you&apos;ve known him for years which is quickly making him a fan favorite. Being the youngest in his Biblically-named family, Jeff was destined for the life of comedy. His animated and goofy demeanor combined with edgy quips covering his family, dating life, working out and food make for nonstop laughs.